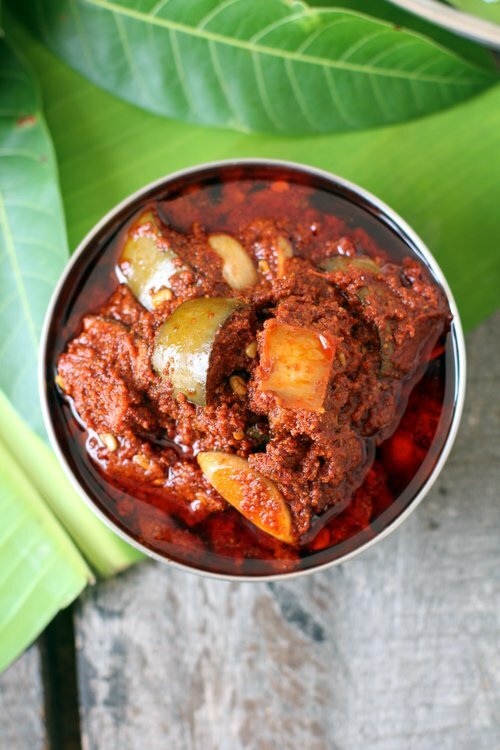 Its a known fact that Andhra is synonymous with ‘avakai’ or mango pickle. Andhra mango pickle goes by the name avakai or avakaya. The main ingredients of avakai are ‘ava’ which means mustard and ‘kai’ or ‘kaya’ meaning raw fruit. 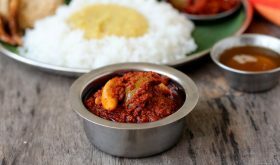 There are numerous popular variations of avakai like bellam avakai or sweet mango pickle, endu avakai (sun dried), allam avakai (ginger), nuvvu avakai (sesame seeds), pesara avakaya (moong dal), mamidikaya menthi pachadi and many more. But the king of pickles, avakai, is unbeatable in flavor. One of the best traditional culinary gems of Indian food. It goes without saying that no Andhra meal is complete without avakaya. 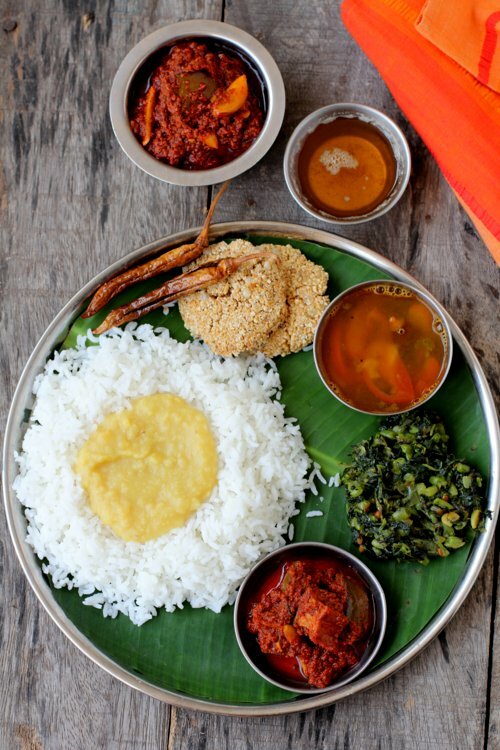 We, telugu people, take pride in serving our guests a comforting Andhra meal consisting of hot steamed white rice, mudda pappu (mashed tur dal), kotha avakaya (freshly made mango pickle) with a dollop of ghee (clarified butter) along with a vegetable stir fry or curry, charu (rasam), appadam, perugu (yogurt) and majiga mirapakayalu (sun dried chilies). The good part of summer in our part of the world in Andhra is the arrival of the king of fruits, green mangoes and kotha avakai (freshly made mango pickle). Every year, come summer, mango pickling is a culinary tradition that is followed with utmost reverence, excitement, care and love. It is a fun process where the whole family, including extended family members pitch in to make avakai and fill large jaadis (ceramic pickle jars or bharanis) with prepared avakai. As children, we would visit our mango farm with my grandfather to watch the mangoes plucked off the tree to make mango pickle. The mangoes are supposed to be hand plucked and carefully brought off the tree without letting them fall on the ground. Even a small bruise to the mango is rendered useless to make mango pickle. Absolutely firm, mature, fiborous, unblemished, sour mangoes are required. 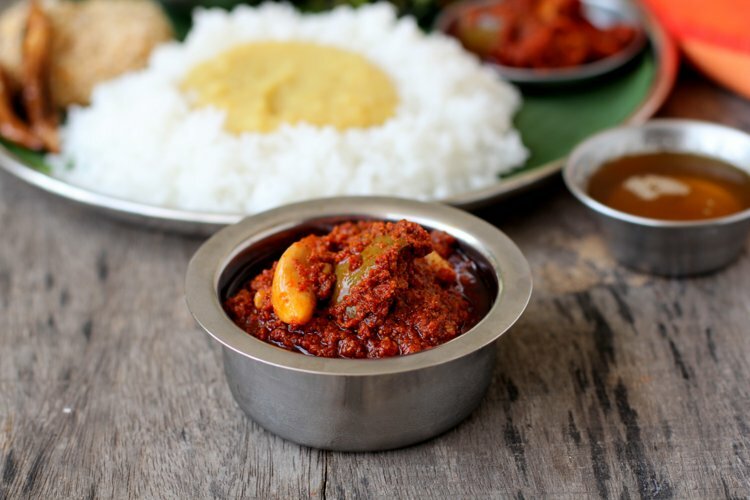 Once the mangoes are plucked, they are to be used the same day to prepare the mango pickle. The fresh raw mangoes are soaked in water for an hour, wiped dry and carefully cut with a special knife. It does take a special skill to cut the mangoes with the kernel (tenkai or outer core) intact and into uniform size pieces. The pith is discarded while the hard kernel is left intact and the wafer thin transparent layer lining the kernel is removed with a help of a spoon or knife. Each mango piece is then carefully cleaned with a soft cloth and laid out to be dried on a cloth for an hour or two before beginning the pickling process. If any of the pieces do not have the kernel or green skin, they are discarded. Following the pre-pickling steps meticulously is extremely crucial to achieve good results and a pickle that will last a whole year. 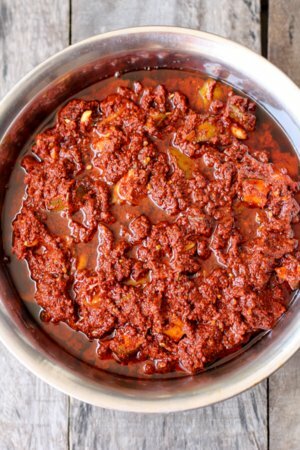 The other important components of mango pickle recipe is the use of freshly ground mustard powder, red chilli powder used for making pickles, crystal salt (powdered) and cold pressed gingelly oil (unrefined sesame oil that is golden in color also called pappu nune/nuvvu nune) in telugu). Usually Bandar mirapakaayalu (a variety of red chilis), Ballari (or Bellary) or Kashmiri red chilis are used to make mango pickle. The red chilis are sun dried and ground to a fine powder. Now a days, good quality red chili powder used for pickles is available in most super markets. I would recommend using ‘Three Mangoes’ brand of red chili powder if using store bought chili powder. Black mustard seeds are sun dried and freshly ground on the day of pickling so that the pickle retains the fresh flavor of mustard. You can use store bought mustard powder (used for pickles). Use of raw gingelly oil is essential to achieve the authentic, real flavor of avakai and the aroma of mango pickle depends on the type of oil used to make it. Please do not compromise on the use of gingelly oil. Second best oil would be groundnut oil. We make large quantity of avakai at home but for the benefit of my readers, I am sharing the recipe to make a small batch using 3 medium sized mangoes. It is not easy to write the recipe of avakai but I will make a humble attempt to help you understand the pickling process. The best method is weighing the main ingredients. Red chili powder, mustard powder and salt should be equal in weight, i.e 100 gms red chili powder+100 gms mustard powder+100 gms salt. The thumb rule is whatever measure you use for measuring your mango pieces, the same measure of the mixture of spice powders (red chili powder, mustard powder and salt) should be used. In other words, if you use 1 cup of mango pieces, you need to mix it in 1 cup of spice mixture. For beginners or those new to making avakai, I’d suggest you take a bowl and add 1 cup red chili powder, 1 cup mustard powder and a little less than 3/4 cup powdered crystal salt and mix it. Add this mixture to a wide bowl such that it is filled to the brim. This wide bowl will be your measuring bowl for your mango pieces too. For the above quantities of spice mixture and mangoes, you will need 1 1/4 cups oil, 1 1/2 tsps methi seeds and 1/3 cup garlic cloves. The color of the pickle will depend on the type of chili powder and mustard powder used. 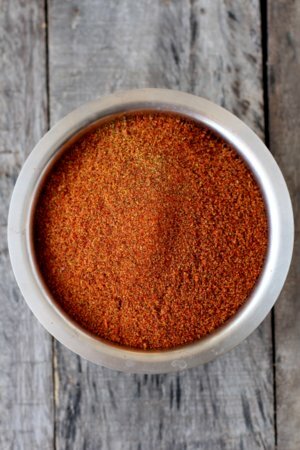 If you use Kashmiri or Bandar chili powder, you will get a lovely bright orange red shade. In our home, we add methi seeds and garlic cloves to the basic avakai recipe. Love the flavor of marinated garlic in the pickle. You can use black chick peas in place of garlic. Once the pickle is prepared and stored in a jar, you need to place the lid, tie a cloth over the lid and do not open the jar for at least 3 days. On the fourth or fifth day, remove the mango pickle into a wide vessel. Mix well with a long ladle that is clean and dry (sun dry the ladle for a few minutes). Add more oil such that it almost covers the pickle as it helps preserve the pickle. Since we make large quantities, we remove the pickle from the jar and mix. If you are making small quantity, you need not remove the pickle from the jar. Mix the contents in the jar with a long ladle and pour oil on top and place lid. I have earlier blogged Dosavakaya (yellow cucumber pickle) and important tips to follow for making pickle. Those tips will be useful for beginners. As I write today’s post, I cannot help but reminisce my childhood days when my grandmother would lovingly feed us ‘annam muddalu’ (rice balls consisting of steamed rice, mudda pappu, ghee and kotha avakai oota). Its pure, comforting, divine food. The tradition of making avakai is followed in our home religiously and am proud that we are preserving our culinary heritage. Annadata Sukhbava! Wash and soak mangoes in water for an hour. Wash the pickle jars and sun dry the jar till completely dry with absolutely no moisture. Wipe the mangoes with a cloth and cut them into pieces with the kernel intact. Clean the pieces with a soft cloth and spread them over a dry cloth while you work on the rest of the pickle preparation. . Grind the sun dried mustard seeds to a fine powder. Set aside. Grind the crystal salt to a fine powder. Set aside. Peel the garlic and set aside. 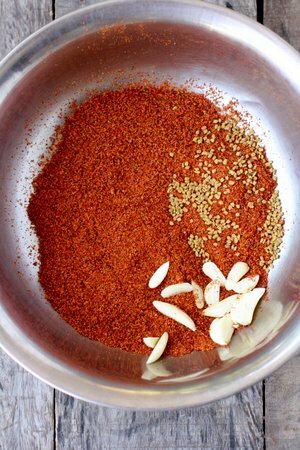 Take a large wide vessel or bowl and add red chili powder, mustard powder and salt and mix well with clean, dry hand. Add methi seeds, garlic cloves and 3/4 cup oil and mix well. When you take a fistful of this mixture and close your fist, it should be able to take shape. Its alright even if it crumbles slightly. Add the mango pieces and mix well with your hands such that the mixture coats the mango pieces. Place the spice coated mango pieces along with some of the spice mixture and add to the jar. Any remaining spice powder should be added to the jar. Pour 1/4 cup oil on top and cover the pickle jar with the lid. Tie a cloth over the lid and keep it in a moisture free area. On the 4th day, open the pickle jar and use a clean dry ladle and mix the contents carefully. Taste the mixture and check if its salty. If required add 1-2 tbsps. Pour 1/4 cup oil on top as the pickle needs to be covered in thin layer of oil. Cover the jar with lid and tie a cloth over it. Let the pickle marinate for another 4 days. After 4 days (i.e 8th day from the day the pickle was prepared) mix the pickle carefully with a clean and dry ladle. The mango pickle is ready for consumption. 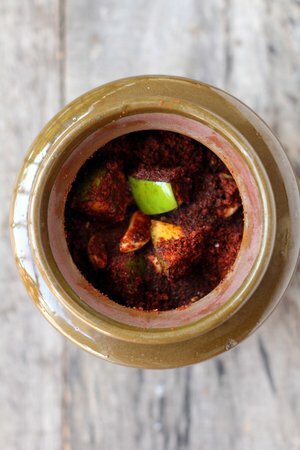 Remove a small quantity of mango pickle into a small bharani or pickle jar for everyday use. Serve kotha avakai with hot steamed rice, mudda pappu (cooked tur dal) and ghee. 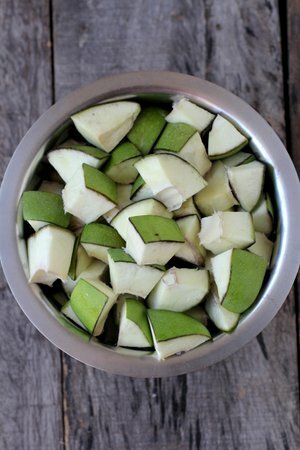 Use pickle variety mangoes that are sour and cut the the pieces with the inner shell intact. 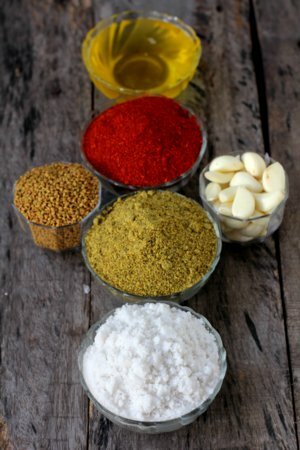 The best way to get your pickle right is to take equal weight of the three ingredients to make spice powder - red chili powder, mustard powder and salt. You can add 1/3 cup black chickpeas (kala chana/nala senagalu) to the above recipe and omit garlic. If you are not using crystal salt but ordinary table salt, remove 2 tbsps of salt from 3/4 cup measure of salt. Oil should float on top. If you feel the pickle is dry, do add some gingelly oil to the pickle jar. Use a dry spoon everytime you remove pickle from the pickle jar. Always ensure the lid is tightly secured with a cloth and the pickle jar is kept in a moisture free zone. If you have any left over red chili powder or mustard powder, place them in a ziplock bag and tightly secure it and refrigerate. Whenever you want to make any pickle, you can use them. Sesame oil should be bought fresh from your neighbourhood oil mill. 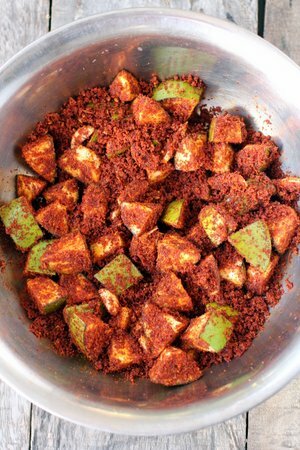 By Sailu Published: May 8, 2015 Mango pickle recipe, avakai, is a traditional Andhra pickle made with raw mango. Every Telugu home takes pride in making avakaya. 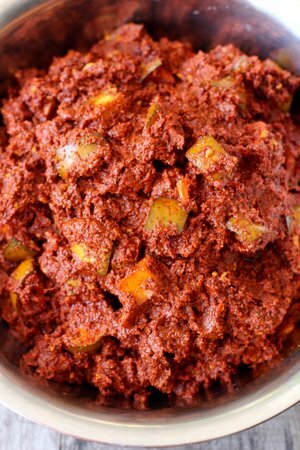 How to make mango pickle. I made it but I think d mustard seeds made it a bit bitter.. How do I remove the bitterness from the pickle.. ?? When did you make it? You need to taste the pickle on the 4th day to know its true flavor. If it’s bitter after 4days then wat should I do??? If you followed the above recipe to the ‘T’, it should not be bitter. Let’s see on day 4.
sailu good description , beautiful and tempting pictures of avakaya. In delhi we get pachadi kayalu in the moth of july, till that time, i will see your avakaya pics before meals. i am greatly impressed with your memories of childhood, which made me emotional, recollecting my own. Mrs Sailu Garu, Please clarify whether the Til oil is required to be heated and cooled before adding to the ingredients. This procedure is followed by my grand mother/ mother. No the til oil is not heated and cooled as you have mentioned. It will change the flavor profile of the pickle by leaps and bounds. Alternately, place the raw oil in the hot sun for a day. It is not essential but you can do it. Thank you for this recipe Sailu. I just love fresh Avakkai pickle. Now I am in the UK. Can I try this using the sour mangoes we get here. Again i don’t think i can cut the mangoes with kernels on it, as i don’t have the mango cutter. Do you think I can still give it a try? Yes, you can make avakai with the sour mangoes. I understand your situation and since you will be making a small batch, its fine even if some of the pieces do not have kernels. Maybe you can refrigerate the pickle once its done. Can I add the garlic at a later stage too? How to do that? Remove the finished pickle to a wide plate. Peel garlic cloves and add them. Mix well and place the avakai in the jar. The pics look good and the avakkai looks mouthwatering 🙂 not everyone at home likes garlic. Can I add the garlic later to already made avakkai? You can add garlic after a week to ten days of making avakai. I must say you have given clear guidelines. Good job. I prepared the pickle for 3 mangoes and it really came up well. For a first timer it is really above my expectation. Making pickle always seemed like a big task but now I have an order from my MIL to prepare it for 25 ?. Big task and I m nervous to take it up. What happens if the kernel of the mangoes are removed. Does it affect the shelf life of the pickle. Kindly reply as soon as possible need to prepare another batch of pickle before the season is gone. Yes, the shelf life the mango is affected. It is very important the kernel is intact. Me vantalu nenu regular ga follow avuthu untanu. Chala varaku vantalu entho simple ga easy chese procedures meru rasthunaru. Me vantala videos kuda teyagaligithe entho upayoga paduthay. Thank you very much for such a wonderful collections. With same recipe can I make radish pickle or carrot pickle…??? I would not suggest the same recipe. You have given a clear idea.. I tried your instruction the pickle came out very good. But I feel it is little salty can you suggest how I can reduce the salty taste. I used sea salt here in US our mangoes are not very sour too. Should I add some more mangoes and citric acid. Can you please reply soon so I can alter it. But the taste is very good. Kindly tell me about the taste of acchar is it salty. Because it looks very tasty and tempting and delicious .I m worried because of on cup salt kindly solve my problem. I tried making the pickle… Even after 4th day it’s bitter what should i do now….. Any fix ? what if the pickle become more spicy . How it can be reduced . You have to add oil or salt again .. Thanks for the recipe it turned out excellent. But i have made two mistakes. How can i correct this?? Oh my god ! The image with the plain pappu, neyyi and freshly made avakai is making me drool! i did everything as you said …bt next day morning have noticed some tiny tiny bubbles over the pickles…is it spoiled? pls tell me how to identify whether it gets spoiled r nt? ?